So, finally, after nearly a year I managed to work out this wonderful textured ” imagined place”. I guess what finally gave me the idea was printing it onto textured paper. The building comes from the Gloucester Road in Bristol . An eclectic mix of different owner occupied shops in a funky Bristol street. Nestling in this street is this abandoned building and I have been going past it on and off for the last few years and it never seemed to be any nearer to getting redeveloped! Luckily. I love the smokiness of this building in this image and the way it wafts upwards. 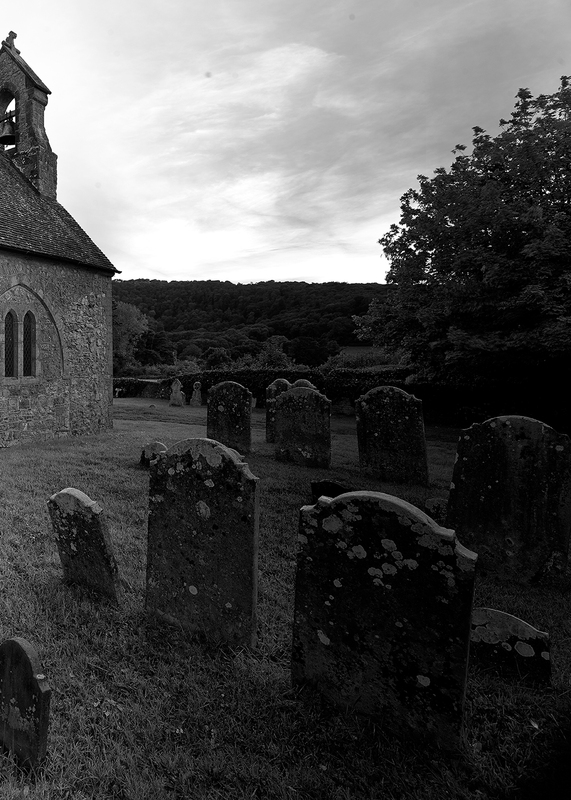 Captivated by these old English churches, I am doing a series of black and white images on them. They will be quite small and with wonderful tones and detail, I hope that they will resonate with many people fond of our architectural heritage. Nestling in the South Downs National Park, Barlavington Church is a real gem with fabulous views over the downs. Keep your eyes peeled for further examples as i capture them and these will be available in my open studios show coming up on November 11th at Wimbledon Art Studios . Having just got back form a frantic hanging and finalising of the event – I have to say it is looking marvellous! I am lucky enough to be organising this pop up show in the Loud and Western building 63 Broughton Road London SW6. It promises to be an eclectic group of artists with one connection. We all work and show together at our open studios in Wimbledon Art studios. This time we have the loan of a fantastic building in Fulham ( thanks Verve properties) and we are coming to FULHAM. We have organised all sorts of things to make this a worthwhile experience as well . The exhibition will feature painting, ceramics, photography, sculpture, glass and more for sale. Doors open from 11am – 6 pm Friday 31st October to Thursday 6th November 2014. Be sure to visit your favourite artists at the Wimbledon Art Studios Open Days, 13 – 16th November 2014. 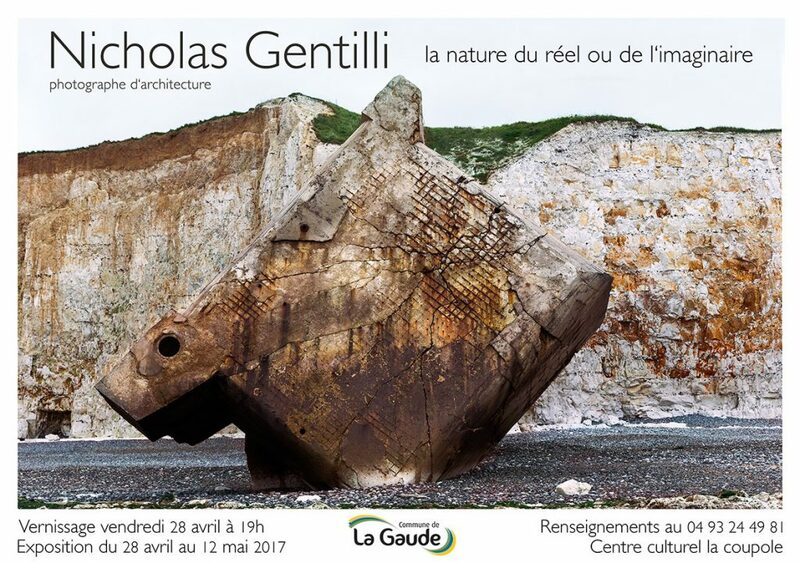 Nicholas Gentilli is a photographer with over 30 years experience of shooting places and spaces. His professional genesis lay, until 4 years ago, in the architectural photography that has represented the ‘bread and butter’ of his career, before he laid down his commercial toolbag in favour a pursuit of his more artistic urges. Q: Tracing this life-long pursuit back to its roots, what was it that first grabbed you? NG: It all began in my university’s darkroom. The patience required by that early photographic method saw a clash with expectation that still inspires me 35 years on. The power of an image tentatively emerging in the semi-darkness was enough to convince me of my career path. Q: How does your career in architectural photography inform your art and the concept of ‘Imagined Places’ that is the fil-conducteur of your work today? NG: Both the time-consuming nature of working on large format cameras and the intrigue of constructed spaces forms the nucleus of my artistic work today. On any given shoot over the last 30 years I might take just 4 or 5 images. Unlike the volume-heavy approach found in fashion photography, I have always valued a more thought-out and measured style. At the beginning of my artistic journey I struggled to break free from the brief-heavy parameters that formed much of my early photography. As I grew into my work as a liberated and autonomous artist I found that these ‘imaginary places’ enabled me to express my fascination with both architecture and image-making via repetition and reconstruction. My art shares the same interpretation of setting through light, shade, mood and colour that brought me such acclaimed results during my professional career. Q: Explain your artistic method. NG: Well, the initial challenge is to find a space that offers something beyond its bare physicality or constructed form. The key here is my commitment to assimilation, which informs my perceptions going forward. This practice of assimilation always used to terrify my clients, as I used to spend at least 35% of their budget ostensibly doing nothing at all, just a slow and meaningful attempt to grow my personal interaction with the project! Once this key process comes organically to its end, the camera work comes into play. This involves an attempt to encapsulate my most earnest response to the space. Generally I now use high-end digital cameras or 35mm hand-held cameras. Once captured, I retreat to my studio for a lengthy review. This acts as a filtering process. Sometimes, if required and the opportunity presents itself, I will return to reshoot. Slowly – and ever so rewardingly – an idea concretises and I will move onto Photoshop, which represents the next stage in my artistic process. I guess in all the process can take up to 10 weeks to produce the finished article, of which I make an edition of 10. Q: Why the move to a more panoramic form in your artistic photography? NG: While photography has always been my lifeblood, I have come to recognise the limitations of a still shot. They have never truly satisfied me artistically: all too often the viewer will find them all too fleeting and shallow to truly inspire response or reflection. The panoramic shots allow me, through repetition, to create a sense of a world unravelling and the multiple perspectives nourished therein will (I hope!) force the viewer to remark, wonder and – eventually – discuss the work in front of them. In a sense I am breaking down my perception of the chosen space and reassembling it into a visual puzzle that catalyses viewer engagement. I think by the very frenetic nature of our existences, the profundity of our surroundings does (quite understandably) pass us by. The very fact that viewers are forced to reconcile the ‘real’ with the ‘constructed’ creates a tension that surges forth from an art form working along the lines of ‘the more you look the more you see’. Q: To finish, tell us about your latest piece and any plans for the future. 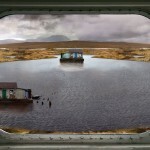 I have been selected by Aesthetica fine art magazine to appear in their book “100 emerging artists” – thanks Jury and panel for liking my artwork :”Au bord de la mer” an imagined place by Nicholas Gentilli on Vancouver and the way that this part of Canada is a frontier between landmass, immigrants and the sea. We’ll against all odds my piece Au bord de la Mer made it to the long list of this prize . That means it gets published in the annual Aesthetica anthology of emerging artists in the world and gets a view at the big show at York St Marys . Anyway it is a bit of fun and a breath of fresh air! I do love this expression emerging artist sounds like I have been hiding all these years! I am planning the first of many visits to Japan to make a series of artworks on Japanese culture which I have always found interesting but of which fundamentally I know very little about .